Pulmonary hypertension (PH) is a devastating disease leading to progressive hypoxemia, right ventricular failure, and death. Hypoxia can play a pivotal role in PH etiology, inducing pulmonary vessel constriction and remodeling. These events lead to increased pulmonary vessel wall thickness, elevated vascular resistance and right ventricular hypertrophy. The current study examined the association of the inflammatory cytokine macrophage migration inhibitory factor (MIF) with chronic lung disease and its role in the development of hypoxia-induced PH. We found that plasma MIF in patients with primary PH or PH secondary to interstitial lung disease (ILD) was significantly higher than in the control group (P = 0.004 and 0.007, respectively). MIF involvement with hypoxia-induced fibroblast proliferation was examined in both a human cell-line and primary mouse cells from wild-type (mif+/+) and MIF-knockout (mif−/−) mice. In vitro, hypoxia-increased MIF mRNA, extracellular MIF protein accumulation and cell proliferation. Inhibition of MIF inflammatory activity reduced hypoxia-induced cell proliferation. However, hypoxia only increased proliferation of mif−/− cells when they were supplemented with media from mif+/+ cells. This growth increase was suppressed by MIF inhibition. In vivo, chronic exposure of mice to a normobaric atmosphere of 10% oxygen increased lung tissue expression of mRNA encoding MIF and accumulation of MIF in plasma. Inhibition of the MIF inflammatory active site, during hypoxic exposure, significantly reduced pulmonary vascular remodeling, cardiac hypertrophy and right ventricular systolic pressure. The data suggest that MIF plays a critical role in hypoxia-induced PH, and its inhibition may be beneficial in preventing the development and progression of the disease. Pulmonary hypertension (PH) is a devastating disease associated with progressive hypoxemia and right ventricular failure. PH is usually classified as primary (idiopathic) or secondary. The World Health Organization (WHO) has proposed a classification system for PH based on common clinical features (1). This classification adds to our understanding of the mechanisms involved and provides a good starting point in developing a rational clinical approach to the management of PH. Clinically the diagnosis of pulmonary arterial hypertension (primary PH) is made when these secondary causes have been clinically excluded. PH can occur in association with chronic lung disorders, with hypoxia playing a pivotal role in the etiology. Reduced oxygen tension provokes pulmonary vessel constriction and if persistent induces pulmonary vascular remodeling resulting in increased vessel wall thickness and pulmonary vascular resistance which in turn lead to right ventricular failure, decreased left ventricular preload and reduced cardiac output (2,3). A major factor in the rapid progression of PH symptoms may be due in part to the creation of a vicious cycle: PH can be initiated by hypoxia, itself causes hypoxia, and hypoxia in return exacerbates PH. Current evidence suggests that hypoxia-induced pulmonary vascular remodeling is a chronic inflammatory process (2,4,5). Macrophage migration inhibitory factor (MIF) is a potent proinflammatory cytokine involved in both chronic and late stage acute inflammation (6), and we have shown previously that the lungs can be a major source of this inflammatory protein (7). 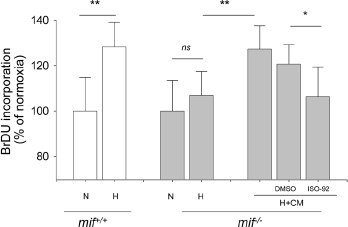 The expression of MIF is induced by hypoxia inducible factor-1 α (HIF-1α) (8,9), and MIF itself can amplify hypoxia induced HIF-1α stabilization, leading to a positive feedback and expression of further MIF and other HIF-1 related factors (10,11). Once released into the extracellular environment, MIF can increase proliferation of cells including fibroblasts (12), endothelial cells (13) and smooth muscle cells (14,15), which are the main components of the vascular wall. Therefore, in this study, we examined the involvement of extracellular MIF in the development of PH, examining plasma MIF concentrations from patients with PH both at baseline and following exercise. We then used in vitro hypoxia-induced cell proliferation and an in vivo mouse model to reveal the critical role of MIF in hypoxia-induced pulmonary vascular remodeling and hypertension. The human studies and animal use received prior approval from the Institutional Review Board and Institutional Animal Care and Use Committee, respectively, at the Feinstein Institute for Medical Research. Patients with (a) primary PH (2 males, 5 females, aged 42–75 years) with a right heart catheterization diagnosis of mean pulmonary artery pressure >25 mmHg at rest or >30 mmHg with exercise and pulmonary capillary wedge pressure <18 mmHg, without other cardiopulmonary disease or known secondary causes for PH; (b) interstitial lung disease (ILD; 3 males, 2 females, aged 35–72 years) characterized by signs of ILD on high resolution computed tomography, and total lung capacity less than 60%; or (c) PH secondary to ILD (2 males, 4 females, aged 54–76 years) meeting both diagnostic criteria for ILD and PH described above, were examined. Plasma MIF concentrations were compared with results from our previously published control subjects (n = 53) from a randomly recruited population (16). The control group comprised individuals who consented to participate, as volunteers, in response to an invitation sent to 1000 randomly selected individuals. No additional exclusion criteria other than unwillingness to participate in the study were applied in the selection of the control group. Patients walked on a treadmill to a speed adjusted to their target heart rate. Oxygen saturation and 3-lead electrocardiogram were measured continuously. To maintain oxygen saturation >90%, supplemental oxygen was administered if needed. The test was terminated if the target heart rate was reached or the patient could not continue due to dyspnea and/or muscle fatigue. Venous blood samples were drawn from an antecubital vein pre- and postexercise. Human lung fibroblasts (CCL-210) were cultured in Eagle’s Minimum Essential Medium (EMEM) with 10% fetal bovine serum at 37°C, 5% CO2. Primary lung fibroblasts isolated from MIF knockout (mif−/−) (17) or wild type C57BL6 mice (mif+/+) were established by outgrowth from lung explants (18) and used during passages 2–6. Fibroblast proliferation was assessed by 5-bromo-2-deoxyuridine (BrdU) incorporation (Calbiochem, Gibbstown, NJ, USA). In some experiments, hemocytometer cell counts were also performed, to confirm the results of the BrdU assay. Cells were cultured in a microenvironment of 37°C, 5%CO2, 100% humidity and either normoxia or 1% O2. 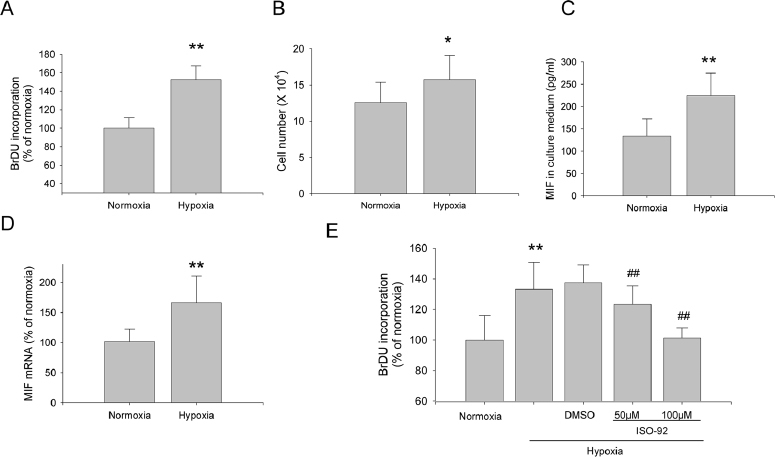 To examine the effects of hypoxia on MIF expression, cell-cycle synchronized human fibroblasts (CCL-210) were cultured in normoxia or hypoxia for 24 h. Culture medium was assayed for MIF protein by ELISA, and cellular MIF gene expression assessed using real-time qPCR (primers: human MIF forward: ACCGCTCCTACAGCAAGC; human MIF reverse: CGCGTTCATG TCGTAATAGTTG). MIF involvement in cell proliferation was assessed in normoxia and hypoxia by incubating cells with a specific MIF inhibitor ISO-92 (19) or DMSO (vehicle control). Additionally, growth of primary lung fibroblasts (mif−/− and mif+/+) cultured in normoxia and hypoxia was assessed. Fibroblasts (mif−/−) were also cultured under hypoxic conditions, in medium preconditioned by fibroblasts (mif+/+) cultured in hypoxia. In some cases, MIF inflammatory activity was inhibited by ISO-92. C57BL6 mice (male, 8–10 wks; Taconic, Hudson, NY, USA) were randomly divided into 4 groups and housed in room air or 10% normobaric hypoxia for 3–42 d. At the time of euthanasia, animals were anesthetized with isoflurane and 100% oxygen. The right ventricular systolic pressure (RVSP) was measured trans-diaphragmatically. All ventricular pressure measurements were made with the animals breathing 100% oxygen to ensure that the measurements reflected changes in pulmonary resistance due to remodeling rather than hypoxia-induced constriction. Blood was then drawn from the right ventricle and plasma stored for MIF measurement. Postmortem, the hearts were removed, dissected and weighed; and the weights were expressed as a ratio of the right ventricle to the septum + left ventricle (RV/S + LV). The lungs were harvested; the left lung being used to assess MIF mRNA expression (qPCR; primers: mouse MIF forward: ACAGCATCGG CAAGATCG, mouse MIF reverse: GGCCACACAGCAGCTTACT), and the right lung fixed, at inflation, for lung vascular histology. To investigate the effects of MIF inhibition, mice were randomized into 4 groups and administered DMSO (control) or ISO-92 (1.8 mg/kg/d, subcutaneous [s.c.]) via an osmotic delivery device (Alzet, CA, USA) inserted subcutaneously on the dorsum of the animals. Immediately after pump implantation, the mice were housed in 10% normobaric hypoxia for two different time periods (10 d and 21 d). At the indicated times, the RVSP, RV/S + LV, and vascular changes were determined. The muscular layer of the lung vessel wall was revealed by immunostaining with an anti-α-smooth muscle actin (anti-α-SMA) antibody (Abcam, Cambridge, MA, USA). External diameter (ED) and internal diameter (ID) of 50 pulmonary small vessels (with ED of 40–100 µm) per animal were measured by an independent investigator blinded to the sample origin. Total wall thickness (WT), that is, mean distance between ED and ID was assessed and the percentage wall thickness (WT%) calculated (20). MIF in human plasma and cell culture medium was evaluated using the Quantikine MIF Immunoassay (R&D systems, Minneapolis, MN, USA). MIF in mouse plasma was quantitated using Western blotting. Data are presented as mean ± standard deviation. Student t test or oneway ANOVA were used to evaluate statistical significance between two and multiple groups respectively. Differences with P values <0.05 were considered significant. Median resting plasma MIF concentrations were higher in patients with primary PH alone (1061 pg/mL; range: 762–3140; P = 0.004), ILD alone (803 pg/mL; range: 292–1845; P = 0.076) or PH secondary to ILD (1424 pg/mL; range 519–4396; P = 0.007) than in a randomly recruited population-based control group (365 pg/mL range: 142–4707) that we have described previously (16). Then the ILD and PH secondary to ILD groups underwent exercise oximetry. In four of five patients in the ILD group, the plasma MIF increased following exercise, but the overall increase was not statistically significant. 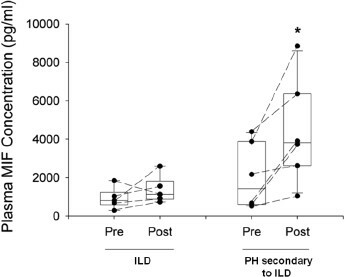 In all seven individuals of the PH secondary to ILD the plasma MIF was significantly increased after exercise (P = 0.02) (Figure 1). Effect of exercise on venous plasma MIF concentration. Following 10 min exercise, adjusted to the patient’s target heart rate, four of five patients in the ILD group had increased plasma MIF concentrations, although the overall increase was not statistically significant. However, in all seven individuals of the ILD + PH, the plasma MIF was significantly increased after exercise (P = 0.02). During the 42 d hypoxic exposure, there was significant remodeling of pulmonary vasculature as indicated by increased vascular wall thickness, and staining of α-SMA within the vessel walls (Figure 2), and percentage of vascular muscularization (Figure 3). To study the relationship between development of pulmonary hypertension and MIF expression, we examined groups of mice after various times of hypoxic exposure (Figure 4). After 10 d of hypoxia, RVSP was significantly increased (Figure 4A), and this was accompanied by right ventricular hypertrophy (Figure 4B). The lungs extracted from these animals revealed approximately 7-fold increases in levels of mRNA encoding MIF by d 3 of hypoxic exposure, peaking at d 10 (15-fold increase) before declining by 42 d, to a level of approximately 2-fold higher than baseline (Figure 4C). The mean plasma MIF concentrations (Figure 4D) were also significantly increased at d 10 and 42 (2- and 1.5-fold, respectively). Hypoxia-induced pulmonary vascular remodeling. Mice housed in a 10% normobaric oxygen atmosphere for 42 d demonstrated increased pulmonary vascular cell wall thickness. (A) histological sections from representative mice were immunostained with α-SMA (brown color) to reveal the muscular layer of the vessel wall. (B) Percentage wall thickness (WT%) was significantly increased in hypoxic mice. n = 10/group; **P < 0.01 versus normoxia. Hypoxia-increased pulmonary vascular muscularization. After exposure in hypoxia for 42 d, lung was fixed and stained with anti-α-SMA antibody. Vascular muscularization was evaluated by a blind method. The percentages of nonmuscularized (NM, □), partial muscularized (PM, Open image in new window ), or completely muscularized (CM, ■) vessels at different subgroups with different external diameter (ED <30 µm, 30–50 µm, and >50 µm) were calculated (A). The muscularization index (MI) of every animal was also calculated by the formula: MI = (number of CM × 2 + number of PM)/total observed vascular number (B). (Data presented as average ± SD. *P < 0.05 versus normoxia; **P < 0.01 versus normoxia.) N, normoxia; H, hypoxia. 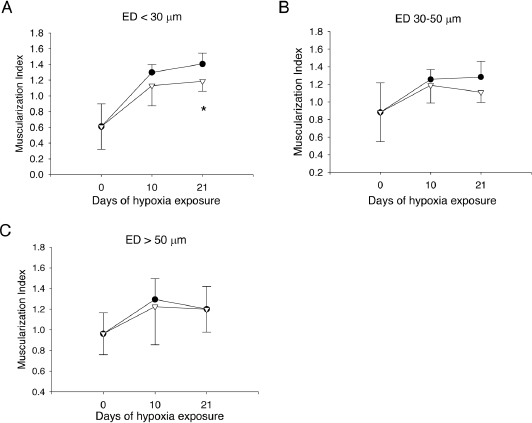 Time-dependent changes induced by hypoxia in a mouse model. 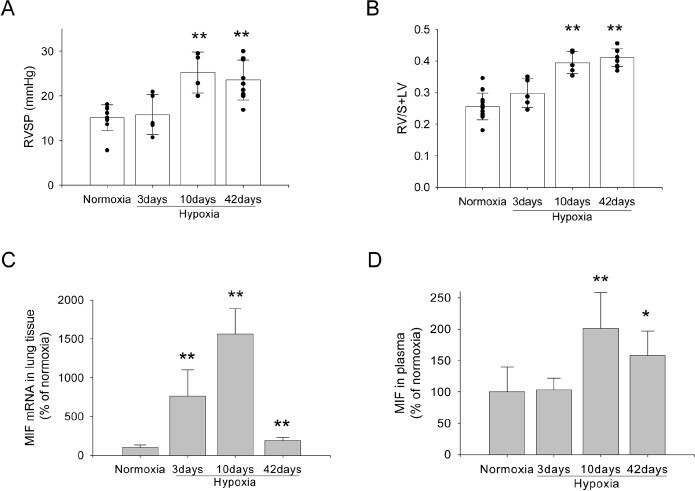 Mice were housed in either normoxia (control) or 10% normobaric hypoxia for 3, 10 or 42 d. (A) Right ventricular systolic pressure measured during 100% oxygen inhalation increased at 10 and 42 d (25.24 ± 4.57 and 23.56 ± 4.46 mmHg, respectively), compared with normoxia controls (15.10 ± 2.91 mmHg); (B) hypoxia significantly increased RV/S + LV ratios (normoxia controls; 0.2563 ± 0.0425, hypoxia: 10 d: 0.3945 ± 0.039 and 42 d: 0.4101 ± 0.0276); (C) MIF mRNA increased in the lung tissue from d 3 (d 3, 10 and 42: 7.6-, 15.6-, and 1.9-fold increases, respectively); (D) plasma MIF protein concentrations were increased at d 10 and 42 d of hypoxia (2.01- and 1.58-fold increases respectively versus normoxia). n = 10 in normoxia and hypoxia 42-d group, n = 5 in hypoxia 3-d and 10-d group, *P < 0.05; **P < 0.01 versus normoxia. The effects of hypoxia on lung fibroblast proliferation were examined both in CCL-210 a human cell line (Figure 5) and in primary mouse lung fibroblasts derived from wild-type (mif+/+) and MIF gene-knockout (mif−/−) mice (Figure 6). We used both BrDU incorporation (Figure 5A) and absolute cell counts (Figure 5B) to evaluate cell proliferation. Both evaluations showed that there was increased fibroblast proliferation in hypoxia. This was associated with increased accumulation of MIF in the culture medium (Figure 5C), and increased accumulation of mRNA encoding MIF in the cell lysates (Figure 5D). To determine if the increased proliferation was due to MIF, we inhibited MIF activity with the small molecule MIF inhibitor ISO-92. Hypoxia-induced proliferation was inhibited by ISO-92 in a dose-dependent manner. Measurement of lactate dehydrogenase in the medium of the treated cells showed no significant release of this protein indicating that ISO-92 was not cytotoxic at the concentration used (data not shown). 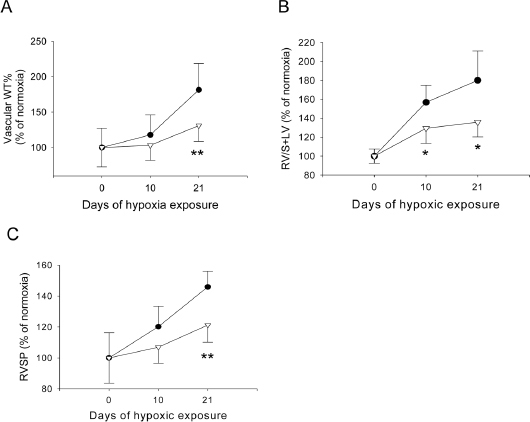 Increased hypoxia-induced cell proliferation in a human lung fibroblast cell line. Human lung fibroblasts (CCL-210) were cultured in normoxia or 1% oxygen atmosphere (hypoxia). After 24 h, cell proliferation was evaluated by both BrDU incorporation (A) and confirmed by cell enumeration (72 h) of hypoxia (B). Cell proliferation in hypoxia was significantly increased compared with growth in normoxia in each evaluation. The increased growth was associated with increased accumulation of (C) MIF in the culture medium; and (D) intracellular mRNA encoding MIF; (E) ISO-92, but not the vehicle DMSO, inhibited proliferation in a dose dependent manner. Data represents at least 3 independent experiments: *P < 0.05, **P < 0.01 versus normoxia; ##P < 0.01 versus DMSO control group. To further investigate the role of MIF, primary lung fibroblasts were isolated from C57BL6 mif−/− and mif−/− mice. Similar to the human cell line, primary mif+/+ fibroblasts increased proliferation in hypoxia (Figure 6). However, there was no increased proliferation in mif−/− cells unless they were incubated in medium conditioned by growth of mif+/+ in hypoxia. This increase in growth was abrogated by the addition of ISO-92 (Figure 6). Increased hypoxia-induced cell proliferation in primary murine lung fibroblasts. Lung fibroblasts were obtained from wildtype (mif+/+) and MIF-deficient mice (mif−/−) mice. mif+/+ cells significantly increased proliferation in 1% oxygen, whereas mif−/− fibroblasts did not. However, mif−/− cells grown in hypoxia and supplemented with medium from hypoxic mif+/+ cell cultures increased growth. This increased proliferation was inhibited by ISO-92, but not the vehicle DMSO. Data represents at least 3 independent experiments: *P < 0.05; **P < 0.01; ns, nonsignificant; N, normoxia; H, hypoxia. Inhibition of MIF significantly reduced the hypoxia-induced pulmonary vascular remodeling, right ventricle hypertrophy and RVSP (Figures 7, 8). Compared with the vehicle control group, the MIF inhibitor ISO-92 infusion significantly reduced pulmonary vascular wall thickness (P < 0.001) and RVSP (P = 0.006) after 21 d of hypoxia exposure, and significantly reduced right ventricular hypertrophy (RV/S + LV) after both 10 d (P = 0.035) and 21 d (P = 0.021) of hypoxia exposure (Figure 7). In addition, MIF inhibition significantly decreased small pulmonary vascular (diameter <30 µm) muscularization induced by 21 d of hypoxia (P = 0.03) (Figure 8). ISO-92 reduction of pulmonary vascular remodeling and hypertension in the mouse hypoxia model. Mice housed in an atmosphere of 10% oxygen were continuously administered either ISO-92 (1.8 mg/kg/d) or vehicle via an osmotic delivery device inserted subcutaneously on the dorsum of the animal. Inhibition of MIF significantly reduced all indications of pulmonary vascular remodeling: (A) vascular wall thickness, (B) right ventricle hypertrophy and (C) right ventricular systolic pressure. n = 5/group, *P < 0.05, **P < 0.01 versus vehicle control. Open image in new window , Control; Open image in new window , ISO-92. ISO-92 inhibited hypoxia-induced pulmonary vascular muscularization. Muscularization index (MI) was calculated during different hypoxia time and by different treatments (ISO-92 versus vehicle control). ISO-92 significantly inhibit hypoxia-induced vascular muscularization in small vessel subgroup (ED <30 µm) at 21 d time point. Muscularization index was calculated by MI = (CM number × 2 + PM number)/total observed vascular number. Data presented as average ± SD. *P < 0.05 versus vehicle group. Open image in new window , Control; Open image in new window , ISO-92. Pulmonary hypertension is a potentially lethal disease with poor prognosis. PH can be idiopathic or associated with other conditions, such as scleroderma (21), sickle cell disease (22) or ILD (23), and is often “silent” with a long period from the onset of vascular proliferation to the earliest emergence of symptoms (24). The symptoms of PH, often subtle in the early stages of the disease, include chronic fatigue, dyspnea, angina, palpitation, and so on, none of which are typical, and this makes the differential diagnosis difficult from other cardiopulmonary diseases. Once diagnosed, individuals with PH demonstrate rapid deterioration, with a median length of survival for patients with primary PH of only 2.8 years, and an estimated 5-year survival rate of 21–34% (25,26). There are limited therapeutic options in PH, and the limitation of current treatment suggests the need for a better understanding of the pathogenesis and identification of new therapeutic targets (27). MIF is a potent regulator of the immuno-response (28, 29, 30) that plays a critical role in the lethality associated with sepsis (17,31,32), and is increasingly recognized as playing a role in altered physiological states from Alzheimer’s disease (33) to sperm maturation (34). Our previous studies have identified the lung as a major source of this inflammatory protein (7). Here, we present data showing that MIF mediates hypoxia-induced pulmonary hypertension. We examined MIF concentrations in human plasma from patients with PH both at baseline and after exercise and used in vitro cell proliferation and development of PH in a mouse model to define the role of MIF in hypoxia-induced pulmonary vascular remodeling and hypertension. Inflammatory mechanisms appear to play a significant role in pulmonary hypertension (4,5,35,36). Therefore, in our initial studies, we examined plasma MIF in individuals with primary PH or ILD alone, or PH secondary to ILD to determine if there was an association between increased concentrations of this inflammatory molecule and the disease. While the study groups were small, individuals with chronic lung disease had increased baseline plasma MIF concentrations and those individuals with more severe disease (PH secondary to ILD) significantly increased the plasma MIF after 10 min exercise. This suggested that MIF may, in part, be regulated by tissue oxygenation. However, the increase of MIF after exercise also may be due to other reasons, such as muscle fatigue, probably muscle hypoxia with inappropriately low cardiac output, or redistribution of blood flow to muscle from core organs such as liver and kidneys, and so on. To examine the role of MIF in the development of PH more fully, we used a mouse model in which the animals were subjected to 10%, normobaric hypoxia. These animals underwent pulmonary vascular remodeling, significantly increasing the vascular wall thickness and vascular muscularization over 42 d. The time-course study revealed that there were significant increases in RVSP by 10 d, and this was accompanied by right ventricular hypertrophy. The increases in RVSP and right ventricular weights were associated with increased mRNA encoding MIF in the lung tissue and increased MIF protein in the plasma. The mRNA encoding MIF in the lungs was significantly increased by d 3 of hypoxia and was 15-fold higher than normal at d 10. By 42 d, the level had decreased considerably but was still at least double the normoxia level. The plasma level of the MIF protein was increased at 10 and 42 d reflecting the increases in RVSP and cardiac hypertrophy evaluations, suggesting that MIF is involved from the early stages in the pulmonary vascular remodeling events. As a final illustration of proof of concept that MIF is involved in the hypoxia-induced pulmonary vascular remodeling and hypertension, we administered ISO-92 (or vehicle control) to mice housed under hypoxic conditions. We used specific inhibition of the inflammatory active site rather than evaluation of mif−/− mice for two reasons. First extracellular MIF is known to have inflammatory activities that are associated with the hydrophobic pockets located between adjacent monomers. Blockade of this site can inhibit the activity of the molecule (32,55). Our in vitro studies shown in Figure 6 suggest that the mediator of hypoxia-induced fibroblast growth was extracellular and could be transferred in culture media and inhibited by ISO-92. Second, MIF also has a thioreductase activity (56) and this intracellular activity can be protective in times of oxidative stress (57,58). Thus, to examine the role of extracellular MIF on the hypoxia-induced vascular remodeling, we administered ISO-92 to inhibit the inflammatory site and avoid confounding conditions occurring in the total absence of MIF. Inhibition of the MIF inflammatory site significantly reduced vascular remodeling and right ventricular hypertrophy. The overall benefit being the reduction of right ventricular systolic pressures by approximately 53% at 21 d. In this study, we did not examine optimal dose or timing of drug delivery initiation. The administration conditions used were such that the drug delivery pump was inserted before hypoxic exposure to avoid animals experiencing multiple changes in oxygen tension that would occur with a surgery postinitiation of hypoxia. While future studies will address whether the in vivo vascular changes in smooth muscle actin expressing cells are due reduced smooth muscle cell or myofibroblasts, inhibition of the MIF inflammatory active site clearly suppressed the development of PH. Overall, the data suggest a key role for MIF in the development of hypoxia-induced pulmonary vascular remodeling and hypertension. Since baseline plasma MIF is increased in individuals with ILD and PH, and can further increased on exercise, MIF may prove to be a useful biomarker in the diagnosis and treatment of hypoxia-driven PH. Perhaps more importantly, inhibition of MIF inflammatory activity may be a useful treatment strategy to inhibit the development and progression of hypoxia-induced vascular remodeling and the devastating consequences of the development of pulmonary hypertension. 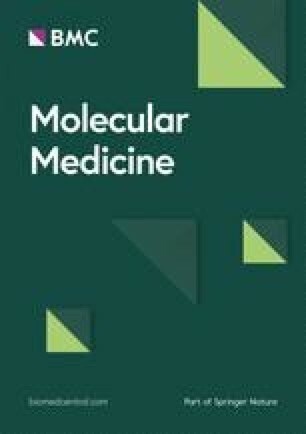 The authors wish to thank following for their support: Pulmonary Hypertension Association (Fellowship, Y Zhang); The Empire Clinical Research Investigator Program (Fellowships, A Sadoughi and K Omonuwa) and The Feinstein Institute for Medical Research, for intramural funding (EJ Miller, A Talwar).